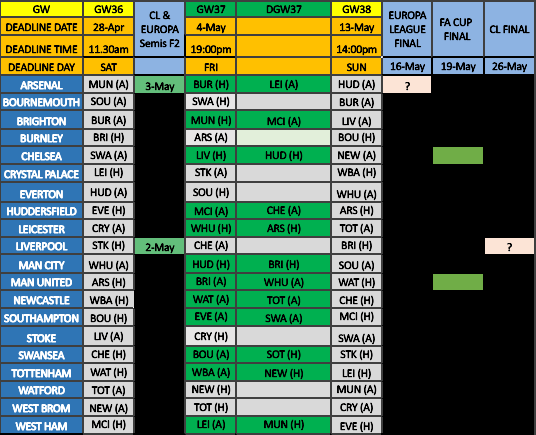 With the last B&P’s covering two game-weeks, one of which was the DGW34, there are far too many fixtures to run through in great detail. The notable result of GW34 was of course West Brom’s 0-1 victory at Old Trafford, a result that confirmed Man City as Champions. I suspect nobody seen that coming, or maybe Init did as he seems exceptionally good at this predicting lark. Speaking of City, their 5-0 win over the Swans in GW35 showed us that they’ll not be heading for ‘the beach’ anytime soon, despite wrapping up the title at a canter, which of course makes life a little easier for us lot over here. We have two lots of winners this week. In DGW34 it was Padster who came out on top with 15pts, second place with 13pts was shared by Jamie Mc and the only GP I know who’s not a total ____, Well played. 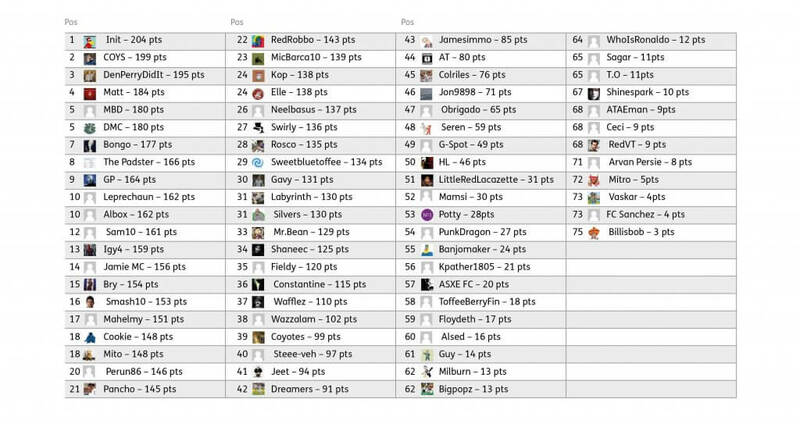 In GW35 top spot was shared between Mr. Bean and COYS, a win which may yet see the title snatched from Init’s grasp. Third placed was also a tie, Neelbasus and Constantine with 7pts apiece. Top darts. Thanks to everyone who entered, better luck next week everyone! Congrats Padster, Mr Bean and COYS, please contact FF247 at contact@fantasyfootball247.co.uk to get your hands on that FF247 t-shirt. The rules are few; 1 entry per person, and all entries must be submitted prior to the first game of the game-week. Kick-off this week comes on Saturday at 12.30. Once all the games have been played, we’ll count up the scores and the winner(s) will be announced in the following weeks competition article. So just to recap all you need to do is copy and paste the fixtures from below, pop your score prediction on each and then tell us who you think will be the first goal scorer of the week. And that can be from any game regardless of your other predictions. Oh and if you say 1-0, you mean 1-0 to the home team. Not either team. Capiche? This article was written by Barry and Paul… aka Matt and Rosco.